Cybersecurity is the key to a safe and secure environment in both digital and physical environments. Despite the fact that the cybersecurity industry is witnessing a major shortage of qualified professionals in the job market, managing to hit a zero percent unemployment rate, it appears that only 11% of the workforce in cybersecurity is women. The picture is much bleaker when executive roles are considered with a worldwide percentage of only 1% of C-Level Executive roles are held by women. 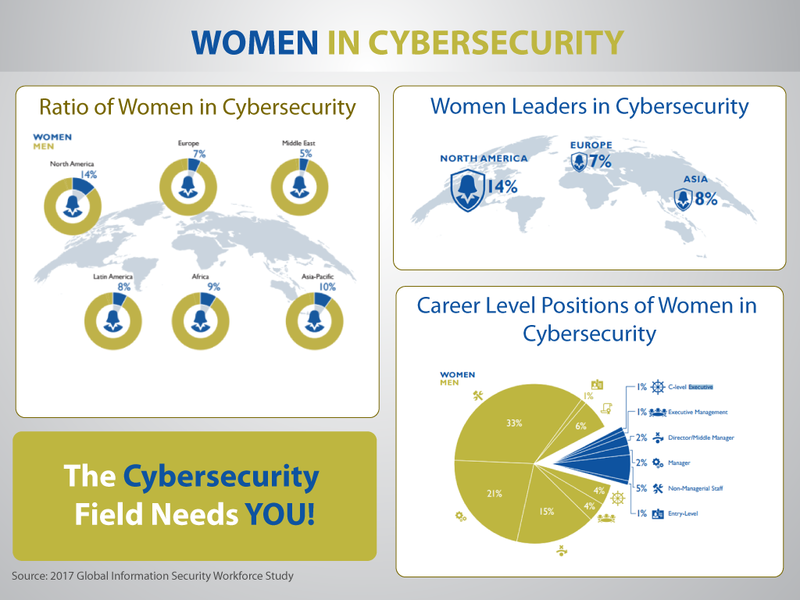 “Getting more women into the cybersecurity workforce will be key to addressing the current and expected labor shortfalls.” – Rick Ledgett, Former Deputy Director, NSA. The need for women in cybersecurity is often perceived as a way to bridge the colossal gap between the supply of employees in the industry and the much greater demand for them. However, an increase in the number of people in the industry is not sufficient to bridge this gap as 57% of organizations in Australia stated that the gap is mainly due to the lack of skilled people in the industry. Women can provide the cybersecurity industry with unique perspectives that their male counterparts might overlook. Like all industries, cybersecurity could certainly benefit from people with different outlooks and backgrounds adding their perspectives and expertise. Of course, making the profession all the more accessible to a more diverse group of people is the ongoing challenge but the benefits of solving this problem are potentially huge. As the demand for cybersecurity professionals largely outweighs the supply of professionals, it leaves unlimited opportunities for those choosing to pursue this profession. There are new roles and requirements constantly appearing with the continuous advancement in technology, widening the already large gap in the job industry. There is also a wide range of positions, each offering many new approaches, requiring different skill-sets – digital forensics analysts uncover missing data from digital devices, tracing hacks to their source, penetration testers use various methodologies to find loopholes and vulnerabilities in an organization, while information security leaders ensure the whole security program is running effectively. With this in mind, many organizations have taken a stand to help promote the importance of women in cybersecurity through scholarships and awards.